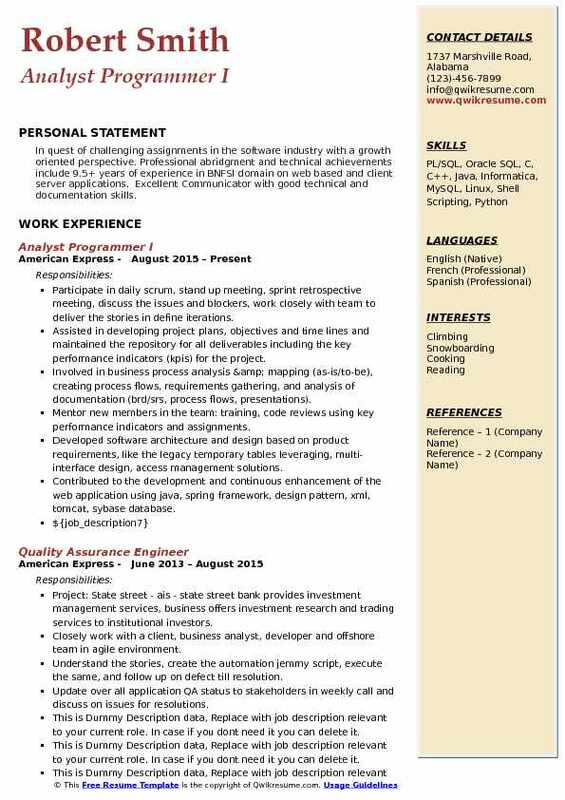 An Analyst Programmer Resume job role basically involves developing, designing and implementing various computer programs. 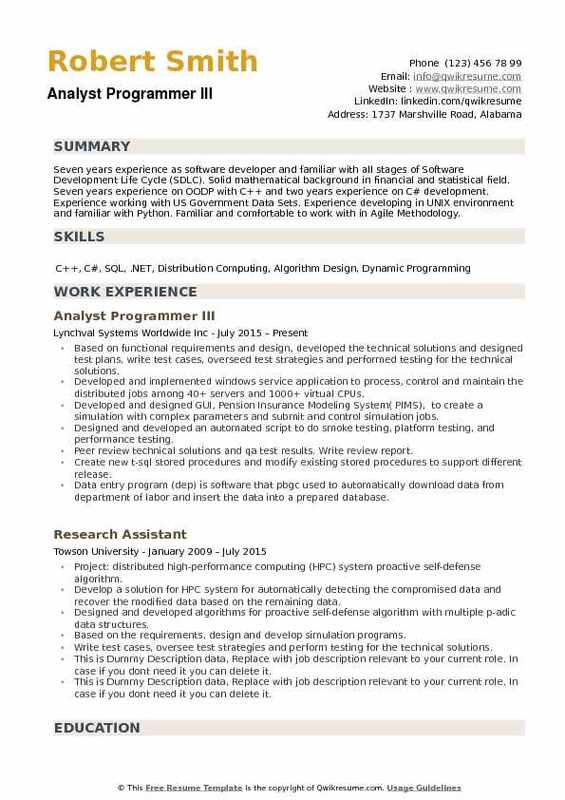 A program Analyst handles the responsibilities of both the computer programmer and System Analyst. Apart from designing programs, an Analyst Programmer work also includes identifying requirements, documentation, design, DB integration, debugging, modifying or repairing the existing programs also. Analyst Programmer possessing excellent knowledge of the latest technology willing to work under a team setup can prove to bring their career to heights. The minimum educational qualification needed to kick-start one’s career in this path is to have a Bachelor’s degree in Computer Science or Information technology. Candidates having up to date knowledge of the changing technologies with few years of experience can enjoy the best pay packages. Summary : Extended experience in managing requirements, software development, delivery, support, and analysis. Strong ability to understand extends and limitations of technologies in addressing particular business requirements. Full product development life cycle experience in scoping, designing, developing, deploying, and supporting business applications in various scales using both waterfall and iterative development methodologies. Participating in the common terminology service 2 (CTS2) for UMLs project, which provides a bridge between the CTS2 Apis and the UMLs database. The project is based on java, groovy, oracle database. Designing and implementing the PGX Project, which is a web based information management system to maintain clinical guidelines. The system is based on java, grails, xml, json and couchdb. Designed and implemented the clinical element model (CEM) standardization project, which allows: Users to create/maintain patterns based on CEM elements and create the mappings between variables to patterns. Participated in designing and implementing ubuilder, a web browser based web design. Management (CRM) service, and content management system (CMS) service. These web sites were designed and implemented with ASP. Net, C#, AJAX, CSS, and SQL server database. Web sites work together to provide a web based e-commerce training service, customer relationship. Investigate and trouble shoot issues during implementation teething period. Summary : Have more than 10 years of experience in software development with in-depth knowledge in Oracle, UNIX Shell Scripting. Currently working as an Oracle/UNIX Developer at IDC. Proficient in Linux, UNIX and Windows based environments. In-depth knowledge in all stages of project lifecycle, from business requirements and technical definitions to development, testing, user acceptance testing (UAT), production support, and completion. Skills : Excellent knowledge in Korn Shell, Perl Scripting, Python, SQL, PL/SQL, Stored Procedures, External tables, SQL Loader and Database Triggers in Oracle. Point of sale (POS) online systems are primarily responsible for aggregating and distributing transaction data from the remote pos systems. POS online systems are also responsible for sending and receiving critical data from several interfaces (certegy, telecheck, galileo, vantiv). Involved in design and development of appriss store boarding file using shell scripts and PL/SQL. Involved in the development of data loading scripts using Korn Shell and PL/SQL. Developed shell scripts for generating xml files using awk, sed, and korn shell. Developed a script to send email notification to the location database support team with the missing store information that is required for fifth third bank. Worked with dbas to create database links for location database (LDB) and came up with a script to refresh local store table from the ldb using the db link. 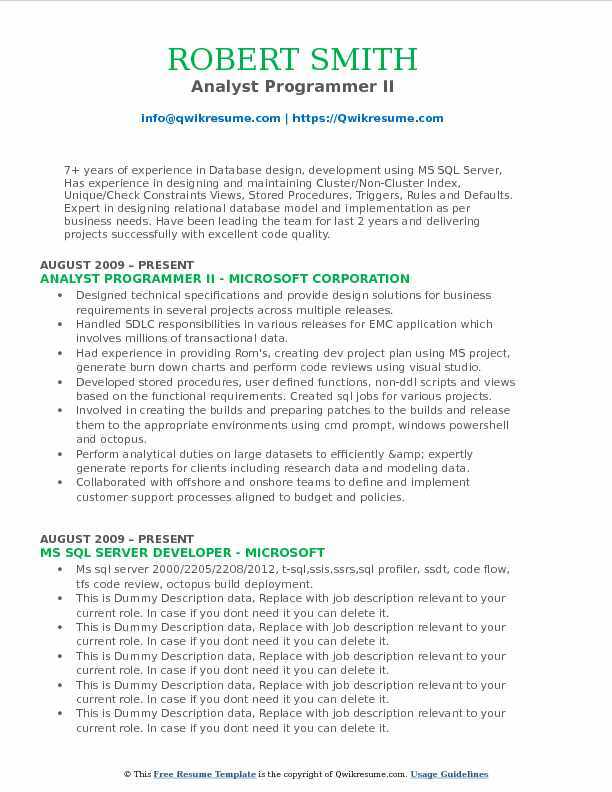 Summary : Over 7 years of experience as Senior Software Developer in Microsoft technologies. Experience in Microsoft Business Intelligence, Reports and dashboards, OLAP cubes. Experience in creating database design, end-end logical and physical data models. Experience in developing/supporting ASP. Net web applications and standalone application using C# and VC++. Supported in estimating large change requests using Function Point estimation method. 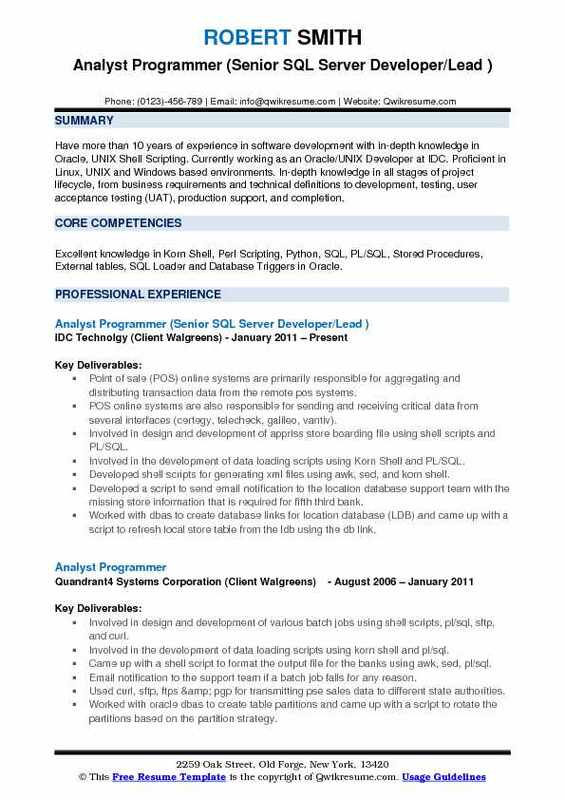 Served both as a SQL report developer and web developer in development of work-flow application for shell -oil, work-flow center of excellence. Design and development of SSRS reports for K2. Net work-flow applications and integrating reports to ASP. Net web application. Created parameterized queries for generating tabular reports, formatting report layout, sub reports using global variables, expressions, functions, sorting the data, defining data source and subtotals for the reports using ssrs 2005/2008/2012 r2. Worked extensively on share point reports and dashboards using XML, SQL server 2008, share point lists and document libraries, oracle as data sources. Designed and deployed tabular, matrix, charts, sub, linked, drill-down, and drill-through reports with drop down list of parameterized options. Developed complex queries, stored procedures, user defined functions, views, cursors, sql scripts. Created deployment packages for reports applications using rs scripter tool and supported in production deployment of reports application. 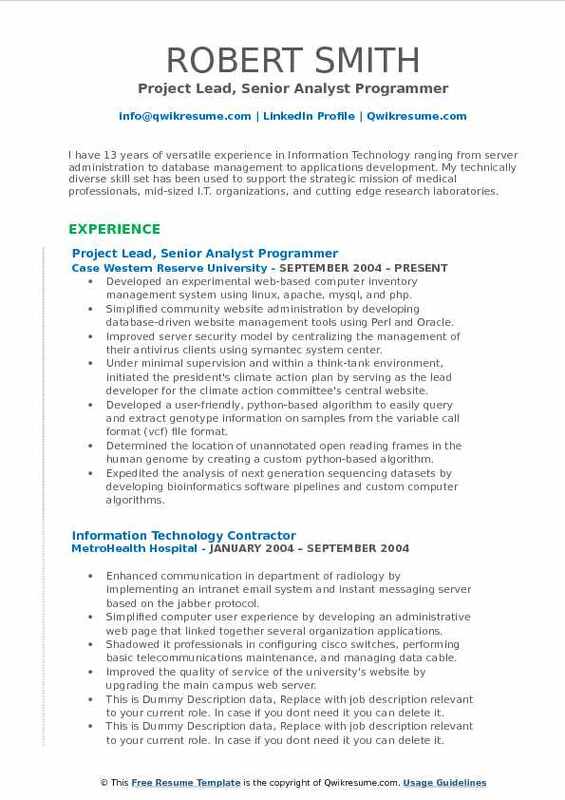 Summary : I have 13 years of versatile experience in Information Technology ranging from server administration to database management to applications development. My technically diverse skill set has been used to support the strategic mission of medical professionals, mid-sized I.T. organizations, and cutting edge research laboratories. Developed an experimental web-based computer inventory management system using linux, apache, mysql, and php. Simplified community website administration by developing database-driven website management tools using Perl and Oracle. Improved server security model by centralizing the management of their antivirus clients using symantec system center. Under minimal supervision and within a think-tank environment, initiated the president's climate action plan by serving as the lead developer for the climate action committee's central website. Developed a user-friendly, python-based algorithm to easily query and extract genotype information on samples from the variable call format (vcf) file format. Determined the location of unannotated open reading frames in the human genome by creating a custom python-based algorithm. Expedited the analysis of next generation sequencing datasets by developing bioinformatics software pipelines and custom computer algorithms. Headline : Around 8 years of experience in all stages of software development life cycle - gathering requirements, design, database creation, and coding, debugging, testing, implementing, documentation, training. Experience in generating Custom Reports and different types of Tabular, Matrix and reports in multiple formats using Crystal Reports and SQL Server Reporting Services (SSRS). Created a custom, angular js single-page, responsive web application using restful web services to replace a legacy line-of-business web application. Performed risk assessments with teams when hard choices had to be made in order to determine whether those choices would accelerate or hinder development efforts. Integrated disparate technologies with microsoft power shell - entity framework, mongodb, asp. Net membership, and sqlite. Developed project relevant documents like Software Requirement Specifications, High level design, Low level design, Technical Architecture, Unit Test plans, System Test plans, Project Release notes, Checklists for coding and reviewing, Coding standards, Project induction manual, Project plan, Statement of Work. Summary : Total 5 Yrs 6 Months of work experience and 4 Yrs 5 Months of work experience in Banking domain. Well versed with the concepts in ETL tool Data Stage 8.0, data warehousing concepts, info web, DB2, UNIX. Hands-on Experience supporting Data Stage 8.0 Batch environments and data warehouse applications Good Experience in Banking (Consumer lending), Credit card Acquisition, Logical, Analytical and good interpersonal skills and commitment to deliver quality work. Handling business IMR's, problem management requests and change management requests to permanently fix the production issues. Designed the etl code and test thoroughly with various testing process in testing environment for all business problem case. Deployed the etl code into production and make sure the business availability. Handle data issues based on priority to avoid delay in GMAR batch jobs process and engage different team for quick impact analysis and resolution. Handling the incident management request raised for problem/difficulty in the real time design/code with priority basis. Monitoring the daily, weekly, monthly, quarterly and other frequency of production jobs to make sure the availability of data for business to enable merchant report and bring in new business with special significant. Served as conduit between customers and the development team, and followed through action points. 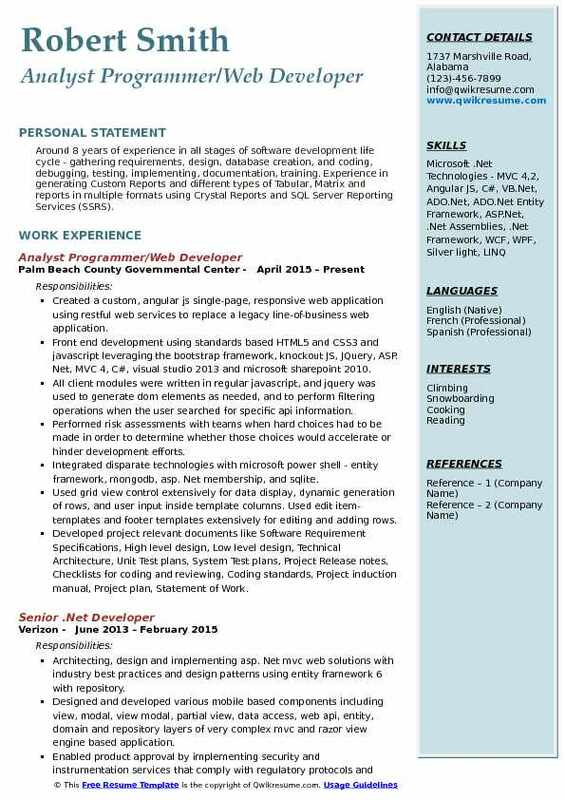 Summary : 7+ years of experience in Database design, development using MS SQL Server, Has experience in designing and maintaining Cluster/Non-Cluster Index, Unique/Check Constraints Views, Stored Procedures, Triggers, Rules and Defaults. Expert in designing relational database model and implementation as per business needs. Have been leading the team for last 2 years and delivering projects successfully with excellent code quality. 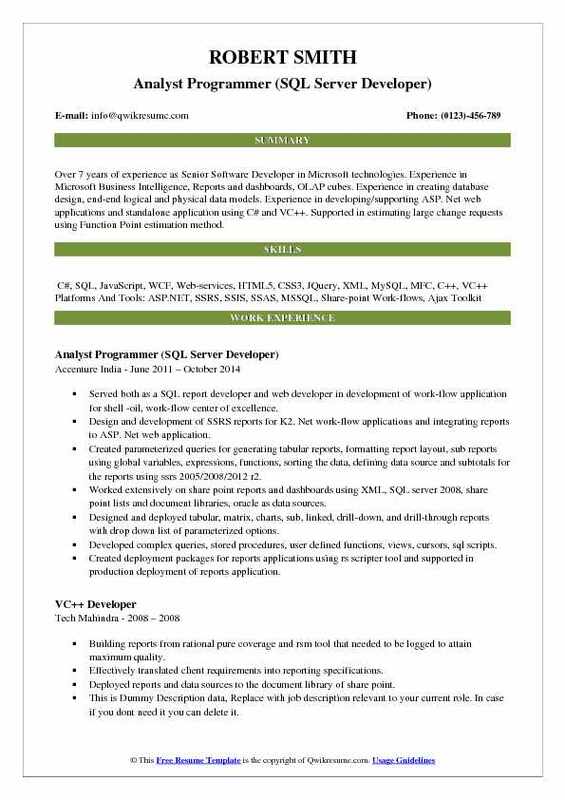 Skills : MS SQL Server 2000/2205/2208/2012, T-SQL,SSIS,SSRS,SQL Profiler, SSDT, Code Flow, TFS Code Review, Octopus Build Deployment. Designed technical specifications and provide design solutions for business requirements in several projects across multiple releases. Handled SDLC responsibilities in various releases for EMC application which involves millions of transactional data. Had experience in providing Rom's, creating dev project plan using MS project, generate burn down charts and perform code reviews using visual studio. Developed stored procedures, user defined functions, non-ddl scripts and views based on the functional requirements. Created sql jobs for various projects. Involved in creating the builds and preparing patches to the builds and release them to the appropriate environments using cmd prompt, windows powershell and octopus. Perform analytical duties on large datasets to efficiently & expertly generate reports for clients including research data and modeling data. Collaborated with offshore and onshore teams to define and implement customer support processes aligned to budget and policies. Summary : Around 7.4 years of excellent hands-on experience in system development, maintenance and production support using SDLC methodology in Mainframes technologies. 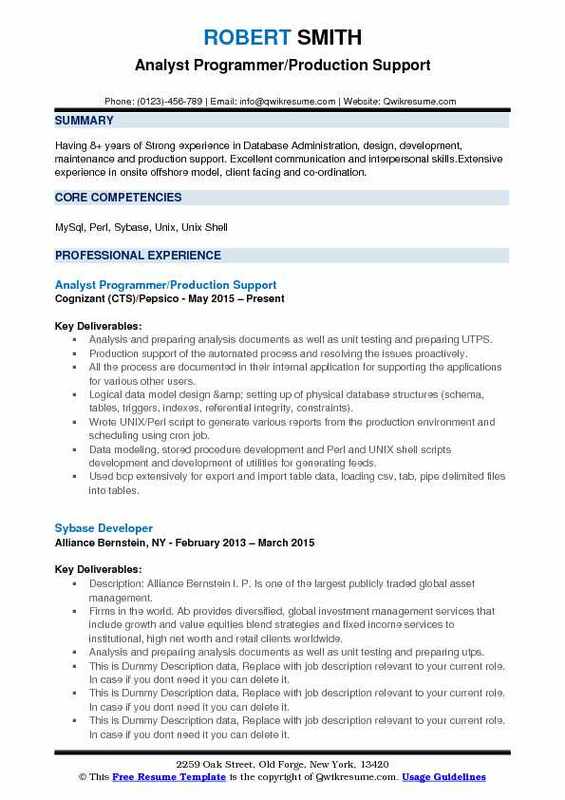 Have experience in analyzing, coding, testing, debugging and reviewing DB2 and CICS programs. Responsible for working in analysis, design stories and providing daily updates in standup meeting. Involved in meetings with client SMEs for requirements on various online(CICS) screens or batch components to be developed or enhanced. Preparation of understanding document, high level design, low level design of the new assignments and enhancements in existing application. Schedule meetings regularly with clients to review the design specs, code modified and test results and get the authorization in each stage. Involved in coding and unit testing phases where the unit testing plans are prepared once the requirements are finalized. Involved in reviewing the code and unit test results, sit results, running the sit and uat cycles end to end. Expertise in employing sdlc models, business process mapping, process flow designs and process improvement. Summary : In quest of challenging assignments in the software industry with a growth oriented perspective. Professional abridgment and technical achievements include 9.5+ years of experience in BNFSI domain on web based and client server applications. Excellent Communicator with good technical and documentation skills. Participate in daily scrum, stand up meeting, sprint retrospective meeting, discuss the issues and blockers, work closely with team to deliver the stories in define iterations. Assisted in developing project plans, objectives and time lines and maintained the repository for all deliverables including the key performance indicators (kpis) for the project. Involved in business process analysis & mapping (as-is/to-be), creating process flows, requirements gathering, and analysis of documentation (brd/srs, process flows, presentations). Mentor new members in the team: training, code reviews using key performance indicators and assignments. Developed software architecture and design based on product requirements, like the legacy temporary tables leveraging, multi-interface design, access management solutions. Contributed to the development and continuous enhancement of the web application using java, spring framework, design pattern, xml, tomcat, sybase database. 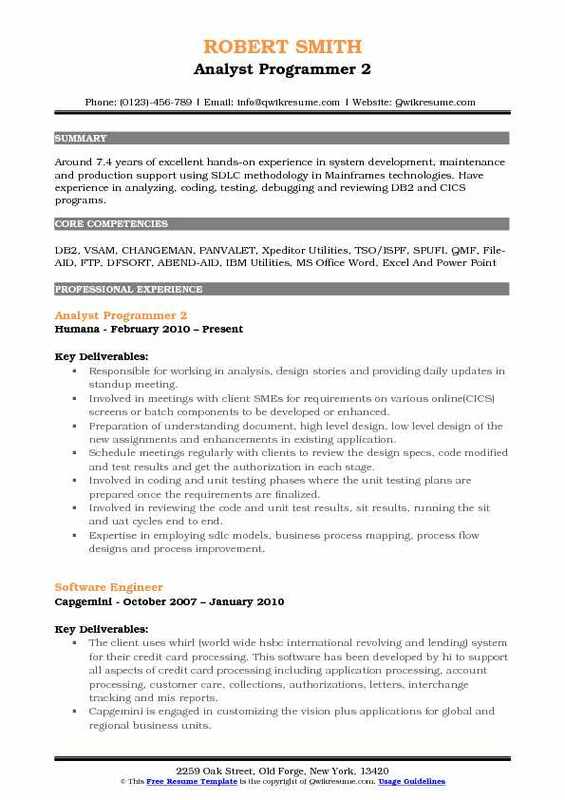 Summary : Seven years experience as software developer and familiar with all stages of Software Development Life Cycle (SDLC). Solid mathematical background in financial and statistical field. 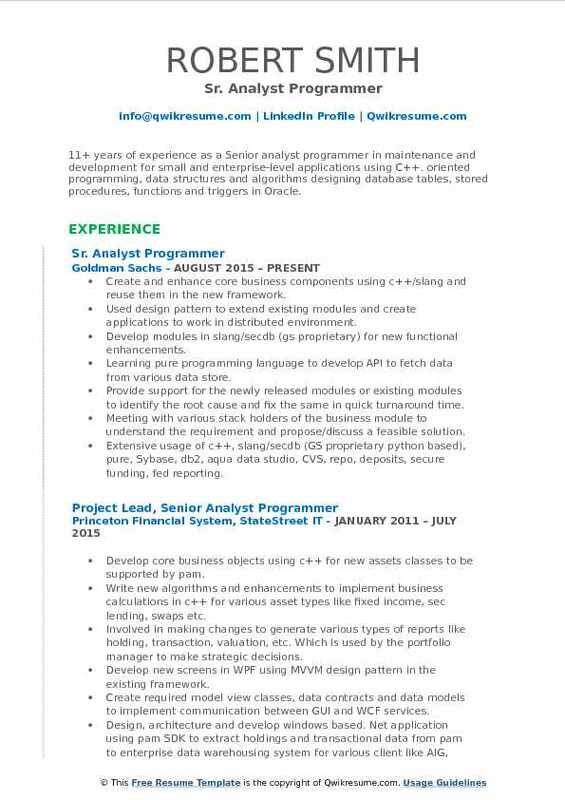 Seven years experience on OODP with C++ and two years experience on C# development. Experience working with US Government Data Sets. Experience developing in UNIX environment and familiar with Python. Familiar and comfortable to work with in Agile Methodology. Based on functional requirements and design, developed the technical solutions and designed test plans, write test cases, overseed test strategies and performed testing for the technical solutions. Developed and implemented windows service application to process, control and maintain the distributed jobs among 40+ servers and 1000+ virtual CPUs. Developed and designed GUI, Pension Insurance Modeling System( PIMS), to create a simulation with complex parameters and submit and control simulation jobs. Designed and developed an automated script to do smoke testing, platform testing, and performance testing. Peer review technical solutions and qa test results. Write review report. Create new t-sql stored procedures and modify existing stored procedures to support different release. Data entry program (dep) is software that pbgc used to automatically download data from department of labor and insert the data into a prepared database. 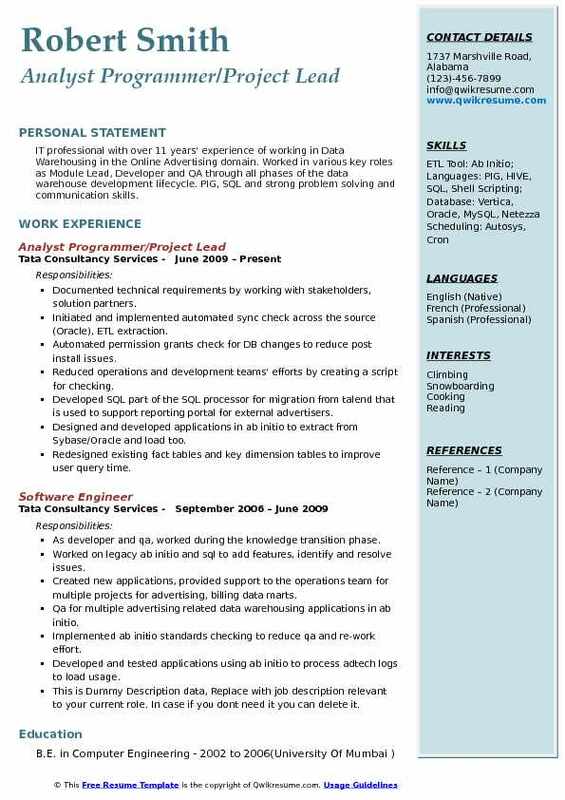 Headline : To utilize my technical skills and 7 years of expertise for achieving time bound results in a position offering growth and development as Analyst Programmer. Worked on all phases of software development life cycle including analysis, design. Expertise in the documentation, providing analysis and estimates, handling client communication. Delivered large scale, mission critical projects on time and under budget. Sound knowledge of production movements, production handling (production failure maintenance). Lead a critical project solely as offshore dev lead and was involved in the entire development cycle of the project. 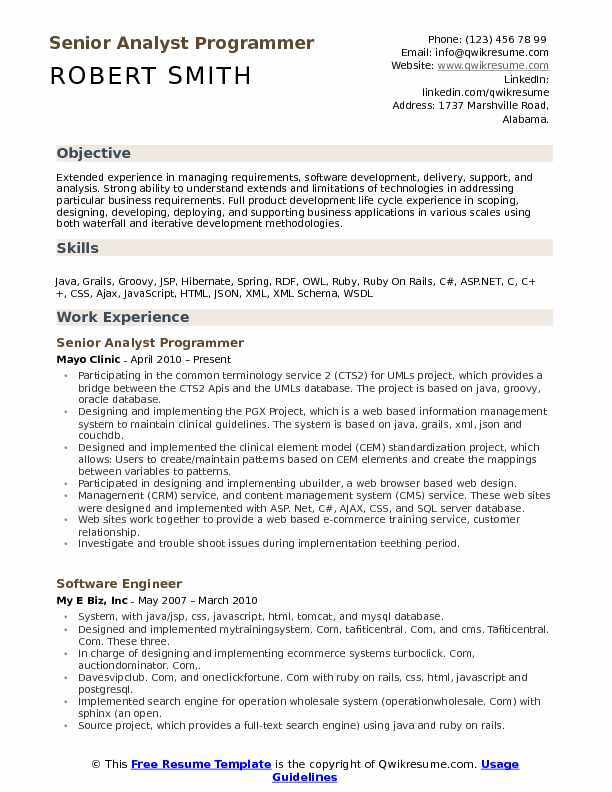 Working as lead etl developer and coordinator from onshore with my current client and have to work closely with the business team to help convert the business logics into technical terms. 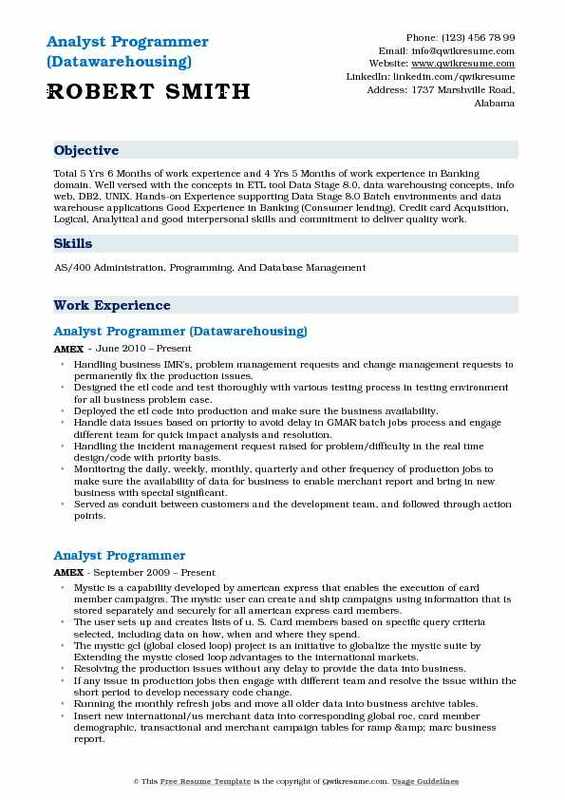 Summary : Having 8+ years of Strong experience in Database Administration, design, development, maintenance and production support. Excellent communication and interpersonal skills.Extensive experience in onsite offshore model, client facing and co-ordination. Analysis and preparing analysis documents as well as unit testing and preparing UTPS. Production support of the automated process and resolving the issues proactively. All the process are documented in their internal application for supporting the applications for various other users. Logical data model design & setting up of physical database structures (schema, tables, triggers, indexes, referential integrity, constraints). Wrote UNIX/Perl script to generate various reports from the production environment and scheduling using cron job. Data modeling, stored procedure development and Perl and UNIX shell scripts development and development of utilities for generating feeds. Used bcp extensively for export and import table data, loading csv, tab, pipe delimited files into tables. 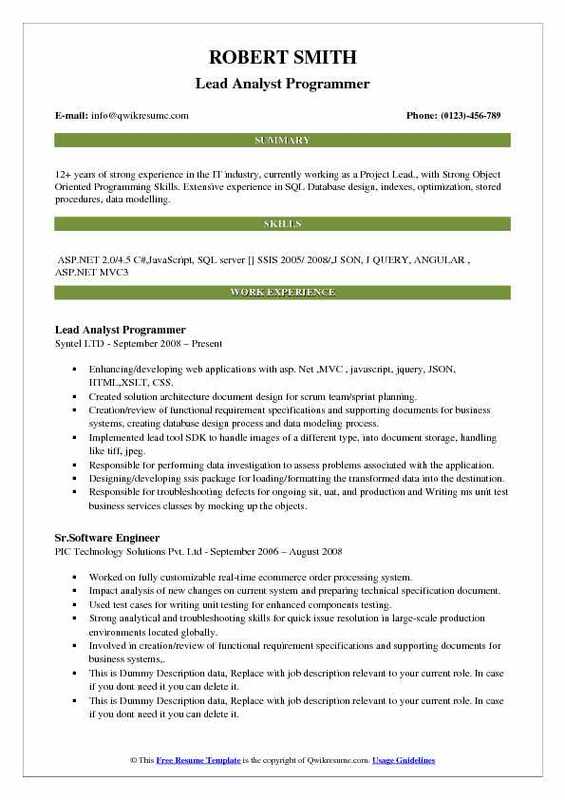 Summary : 12+ years of strong experience in the IT industry, currently working as a Project Lead., with Strong Object Oriented Programming Skills. Extensive experience in SQL Database design, indexes, optimization, stored procedures, data modelling. Created solution architecture document design for scrum team/sprint planning. Creation/review of functional requirement specifications and supporting documents for business systems, creating database design process and data modeling process. Implemented lead tool SDK to handle images of a different type, into document storage, handling like tiff, jpeg. Responsible for performing data investigation to assess problems associated with the application. Designing/developing ssis package for loading/formatting the transformed data into the destination. Responsible for troubleshooting defects for ongoing sit, uat, and production and Writing ms unit test business services classes by mocking up the objects. Summary : 11+ years of experience as a Senior analyst programmer in maintenance and development for small and enterprise-level applications using C++. oriented programming, data structures and algorithms designing database tables, stored procedures, functions and triggers in Oracle. Create and enhance core business components using c++/slang and reuse them in the new framework. Used design pattern to extend existing modules and create applications to work in distributed environment. Develop modules in slang/secdb (gs proprietary) for new functional enhancements. Learning pure programming language to develop API to fetch data from various data store. Provide support for the newly released modules or existing modules to identify the root cause and fix the same in quick turnaround time. Meeting with various stack holders of the business module to understand the requirement and propose/discuss a feasible solution. Extensive usage of c++, slang/secdb (GS proprietary python based), pure, Sybase, db2, aqua data studio, CVS, repo, deposits, secure funding, fed reporting. 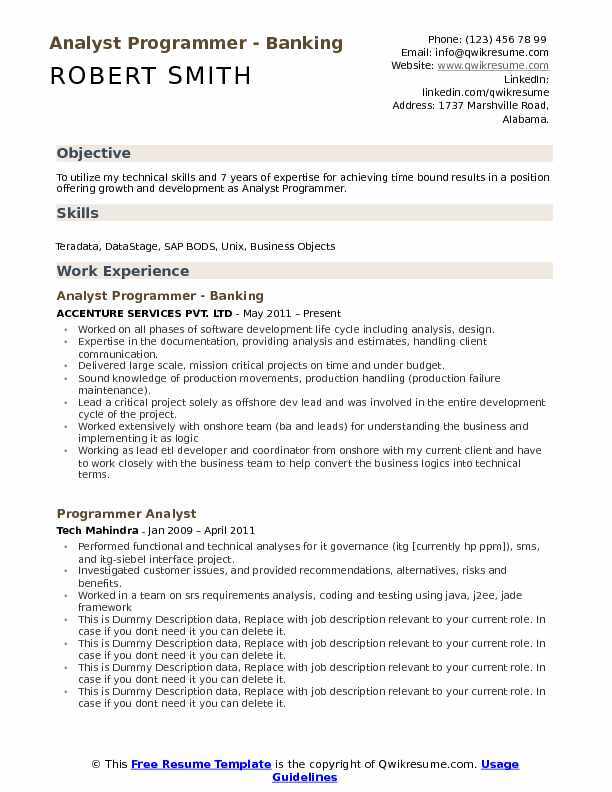 Summary : IT professional with over 11 years' experience of working in Data Warehousing in the Online Advertising domain. Worked in various key roles as Module Lead, Developer and QA through all phases of the data warehouse development lifecycle. PIG, SQL and strong problem solving and communication skills. Documented technical requirements by working with stakeholders, solution partners. Initiated and implemented automated sync check across the source (Oracle), ETL extraction. Automated permission grants check for DB changes to reduce post install issues. Reduced operations and development teams' efforts by creating a script for checking. Developed SQL part of the SQL processor for migration from talend that is used to support reporting portal for external advertisers. Designed and developed applications in ab initio to extract from Sybase/Oracle and load too. Redesigned existing fact tables and key dimension tables to improve user query time.